Have you checked out G. Gedney Godwins baldrics ( www.gggodwin.com )? Some of them look right, and I've read many posts on different forums where they've been highly praised. I know for sure that Mac and David White has them. Then there's Donnie Shearer ( www.themadpiper.com ), who makes baldrics himself, which looks great according to the pics I've seen. 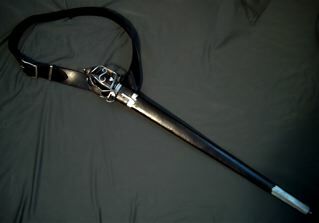 Alexander McCracken has a baldric with buckle, keeper and tip made by him and that one looks great. I think you can find pictures of it if you search in the old threads at the Scottish forum at SFI. I have a pattern for a baldric which I'm testing pretty soon. I'll post pictures of it when I'm done, I think... I did, by the way, make a baldric for my AC Early Basket hilted backsword a couple of years ago, and it's not very difficult... You just need to make a functional paper/cardboard model first. And your set is a very nice one. Where did you source the basket hilt? Steve, what do you mean by "source the basket hilt"? Do you mean where he has the hilt design from? I know there are some basket hilts like that one in some of the museums in Scotland... Just take a look in some of the albums on myArmoury, or take a look in Mac's albums at picturetrail. 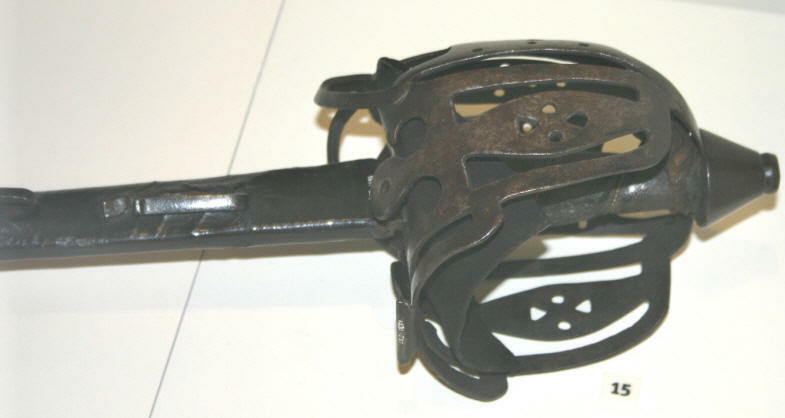 The inspiration Eljay used for Allen's basket hilt is LA 86 (which resides at the Museum of Scotland, Edinburgh) pictured in John Wallace's book "Scottish Swords & Dirks", plate 19 & 24. 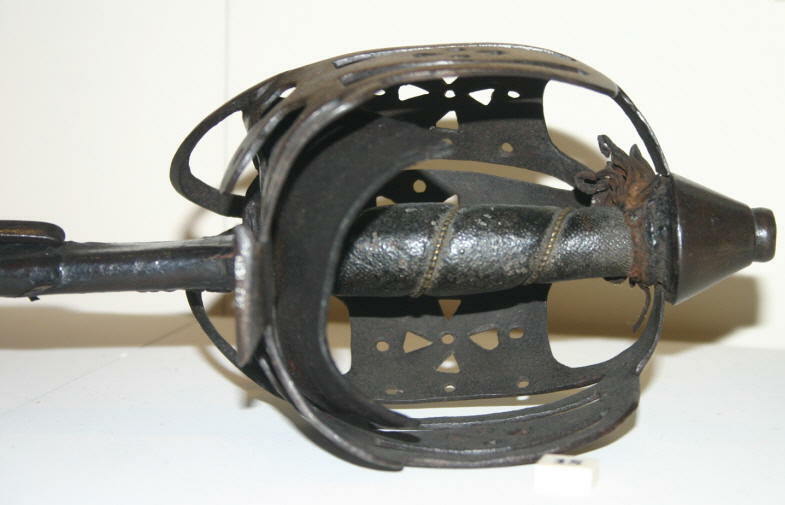 LA 86 - Basket-hilt, 2nd half of the 17th century. Overall length - 39", Blade length - 33 1/2". -- Text, Plates # 19 & 24,'Scottish Swords & Dirks', by John Wallace (1970). Did you get any decent overall shots of the LA 86? I'd love to see what that scabbard looks like! By the way, have you noticed the iron frog-hooks on that regimental-pattern sword's scabbard? Fascinating! 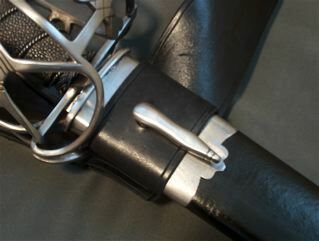 The scabbard on LA 86 is a simple unadorned leather sheath type. Below are a few overall shots of it that Ron Luciano took in 2003, and one closer in shot I snapped in 2004. 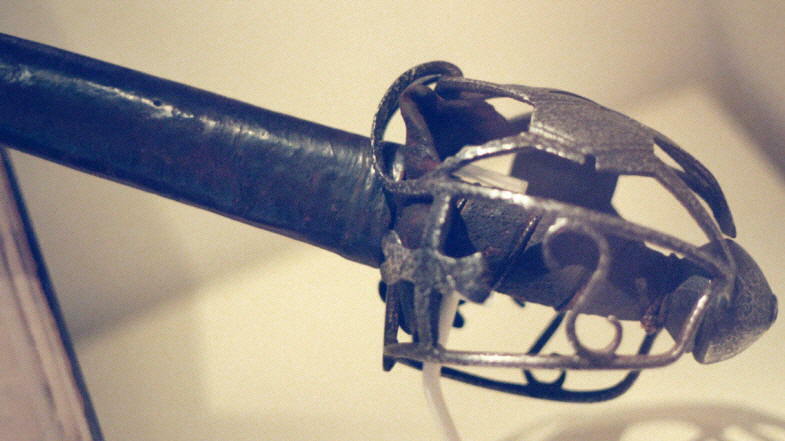 The upper frog hook on that Regimental swords scabbard is actually bent over and somewhat dislodged, here are a few shots that show what I mean, as well as a rear view shot of the hilt itself. I gotta get around to updating some of the pics in those albums, as I have quite a few better shots of them that I took on my last trip! Thanks! 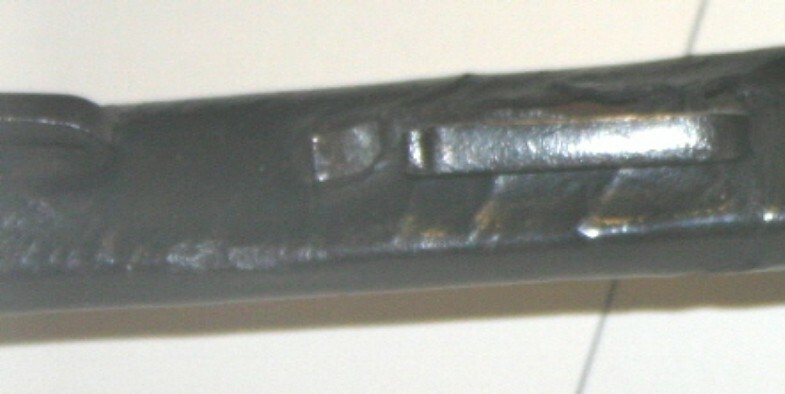 I actually thought the LA 86 scabbard had a froghook as well. Interesting to see such a simple scabbard! What I wonder about that regimental sword is if the scabbard was fitted in a two-frogged baldric, like in the painting of Lord George Murray, or just a single-frogged one like in the portrait of John Campbell, cashier of the Royal Bank... Sadly, one can only guess... Do you know wether Highland regiments in British service had baldrics with one or two frogs? I think it's interesting to see what the froghooks on regular soldiers scabbards looks like, as opposed to the officers scabbards. Far more simple, to say the least! 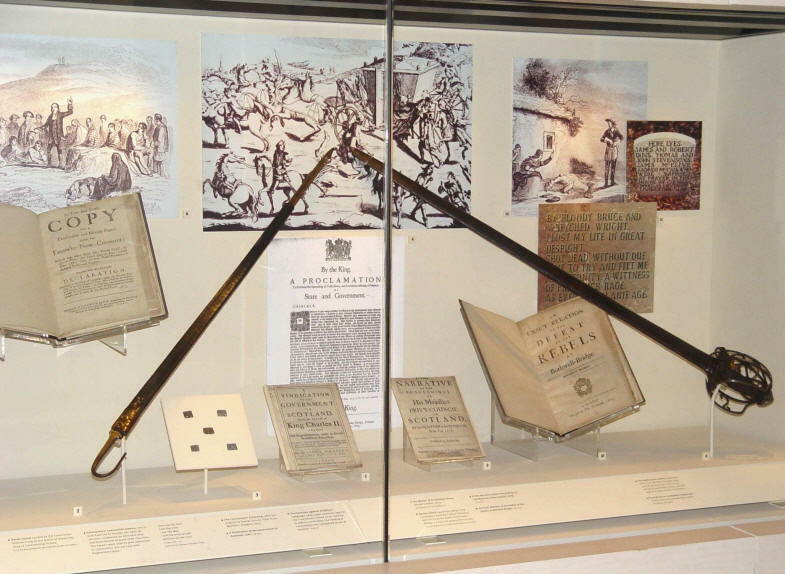 Compare the froghooks to the ones on the scabbard of the Stirling hilted sword in Culloden TSaTS. George, have you checked out G. Gedney Goodwins baldric? I think I'm going with one by Christian Fletcher. By the way I have a set of Donnie's buckles and hardware. I just want a good leather craftsman to put it together.